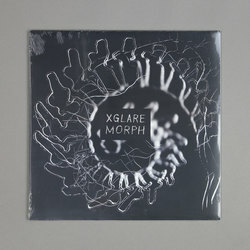 XGLARE - Morph. Vinyl LP. Bleep. Blueberry Records (FaltyDL, Elysia Crampton) drop the debut record from XGLARE. Jessee Egan has gone by many titles in the past - Blue Nile, Gamora and Mystery DJ to name but three - but this new project has her holding her interests in melody, rhythm and harmony in balance better than ever before. A lot of sonic ground is covered across the six tracks of Morph. The styles on display here range from Mark-esque broken jungle (‘Fossa’) to Ziur-style club deconstructionism (‘Morph’) to house deepness with a little DJ Sprinkles to it (‘Plexus’). It’s impressive that Egan manages to make the record work as a whole.